Lions have pretty much the same players which formed the core of Super Kings. The team was further uplifted with the addition of Brad Hodge as their Head coach. The 41-year old from Australia might look old on paper but is still in his playing days, having played the Pakistan Super League earlier this year. It is always good to have some one like Hodge as a coach because the more recently you retire, the more you know about the modern day game. His companion in the bowling department would be Heath Streak. The team will mostly play their home matches in Rajkot. Who better than Shitanshu Kotak would know the local conditions in a thorough way? The 43-year old has represented Saurashtra for nearly 20 years. As a result, the latter has been named as the Assistant coach. Kanpur will be the ground where Gujarat will play their rest of the home matches. Starting from Raina, the team already has a healthy number of players from the winning team of Syed Mushtaq Ali Trophy, Uttar Pradesh. Suresh Raina will lead the side. To talk of their batting order, the Lions have some iron-fisted names at the top of the order. This IPL will be Brendon McCullum's first assignment in his post-retirement era. McCullum is a putative name, especially when it comes to the shortest format of the game. So is Aaron Finch. The 29-year old right-hand attacking batsman from Australia can turn the course of the game on his own. Then is the 32-year old Dwayne Smith from West Indies. Apart from his batting ability, he can also chip in with some overs of right-arm medium pace. The odds of this trio playing together might be less but even if two of them bat for some overs for Gujarat, the opposition team would find itself in an arduous situation. Raina might have not been amid the runs in the ICC World Twenty20 2016 but we all know what he has done and what he is capable of doing in T20 cricket. His right-arm off-spin will also be more than useful for the team. Dinesh Karthik has yet again found himself in a situation where he is representing a new IPL team. To go with his wicket-keeping skills, Karthik also bats well in the middle order and can change gears quickly in the slog overs. Eklavya Dwivedi, Umang Sharma and Akshdeep Nath have been directly imported from the winning squad of Syed Mushtaq Ali Trophy, Uttar Pradesh. The 32-year old Jaydev Shah (also from Saurashtra) bats left-handed in the middle order. Having represented Rajasthan Royals, Kings XI Punjab and Kolkata Knight Riders in the past, Paras Dogra is another experienced campaigner in Lions' squad. They have also bought, the recent India U-19 team's captain, Ishan Kishan. The squad has some prominent names in the all-rounders section as well. First of all, will be the local boy, Ravindra Jadeja. Jadeja is a master of bowling in T20s, especially in Indian conditions. His hitting ability down the order would prove beneficial for the team. The Lions also have 'DJ' Bravo in their line-up. 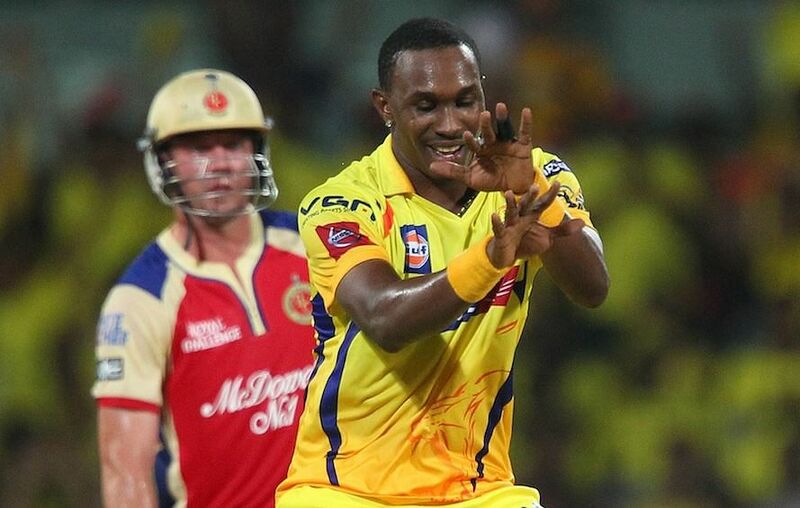 Dwayne Johnson Bravo, 32, is capable of doing every single thing that can be done on a cricket field. He can play the big shots without wasting much of time. His right-arm medium-pace is more than capable of bowling 24 deliveries. He is also an acrobatic fielder. But the most exciting part of his presence would be his 'celebrations' on the field. 'DJ' Bravo will hold the key in the middle overs for Lions. They have another splendid all-rounder in James Faulkner. The 25-year old Australian bowls left-arm fast-medium and is mighty with his batting down the order. In the fast bowling armory, Gujarat will have the zip of Dale Steyn. Having played for Royal Challengers Bangalore, Deccan Chargers and Sunrisers Hyderabad in the past, Steyn is all set to represent his fourth franchise in IPL. He might not play all the matches, but will always be the go to man for young Indian seamers. Andrew Tye made an Australian debut earlier this year. He would further want to increase his skills in the IPL. Dhawal Kulkarni and Praveen Kumar will play in the majority of matches as experienced pacers from India. Pradeep Sangwan and Amit Mishra would also be looking for an opportunity at some point in the tournament. Praveen Tambe is another of those players for whom age is just a number. At 44, his canny leg-spin might test the opposition's batsmen. Having played for Chennai Super Kings and Royal Challengers Bangalore in the past, Shadab Jakati bowls a skillful brand left-arm orthodox. The 29-year old leg break bowler from Punjab, Sarabjit Ladda would also be expecting some chances coming his way. Shivil Kaushik might not have played domestic cricket but his performances in the Karnataka Premier League have earned him an IPL contract. He is termed as a 'mystery' left-arm spinner. Gujarat, beyond doubt has the potential on paper to turn the tables. You never know what might happen if they transfer their potential on paper to performance on the scoreboard. The squad might look as a derivative of Chennai Super Kings but it does not have MS Dhoni. The latter is the captain of a different team. It would be thought-provoking to see Raina lead a side for the whole season. Not that he is not capable of doing it but things change for you in cricket when you are given the role of leading a side.